When my brother Lincoln and I grew up, we moved throughout the world. As children of an American diplomat, we lived on three continents and learned to appreciate people from other cultures. In 2010, I hosted a delightful young woman from Bhutan. I have never traveled to Bhutan and did not know my guest until she arrived in Switzerland! The story of how she came to Zurich begins thirty-four years ago. Lincoln a free-lance photographer and his wife Mayumi previously resided in Hong Kong. In 1981, Mayumi participated in a University of Hong Kong tour of Bhutan. She met a Bhutanese lady, Wangmo, while attending a festival. They found out they were both fans of Heinrich Harrer, an Austrian mountaineer and author of “Seven Years in Tibet”. 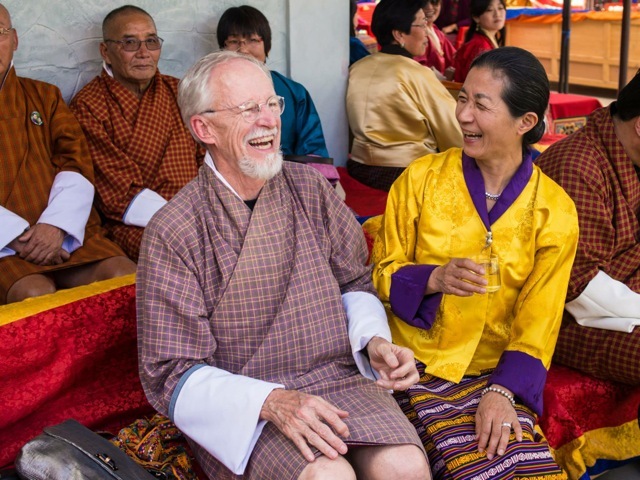 Incredibly, Harrer was in Bhutan attending the same festival! The two ladies became fast friends and Mayumi and Lincoln traveled to Bhutan many times to visit Wangmo and her husband, Penden. Lincoln also worked for the Bhutan Tourism Authority traveling the country and producing their first comprehensive library of photos for brochures and media outlets. Bhutan was only recently opened to tourism. So Lincoln was able to photograph many sites and objects still in a very pristine condition. Lincoln and Mayumi also hosted Wangmo and Penden at their home on Cheung Chau Island in the Hong Kong archipelago. Their guest slept on a futon below a family of spiders that kept the tropical flat mosquito free! Lincoln and Mayumi’s home was a garden flat sitting on a cliff overlooking a peaceful rocky bay. Sometimes a large Junk with a noisy family onboard arrived for a quiet night away from the crowded harbor. Looking down on the dark water with white phosphorescence on the whitecaps, one would never guess that a fall into the Hong Kong waters resulted in a rush to the hospital for a stomach pumping and Hepatitis immunization! When Wangmo gave birth to a daughter, Pema in 1986, she asked Mayumi to be the godmother. Later Lincoln and Mayumi moved to Seattle, Washington. When Pema was twenty, she enrolled in the University of Washington to study museum management. Lincoln and Mayumi welcomed her into their family, providing a home away from home. After graduation, Pema moved to Zurich, Switzerland and worked on the 2010 Bhutanese exhibit: Bhutan, Sacred Art from the Himalaya. The exhibit, housed at the Rietberg Museum in Zurich, had toured Honolulu, San Francisco, New York, Paris and Cologne before its final display in Switzerland. Pema was the go between for the Rietberg Museum, the Country of Bhutan and 2 Buddist monks, Nima and Kinzng Thinlay who stayed at the museum performing rituals to keep the holy temple items pure. The rituals were conducted daily at 10:30 a.m. and 3 p.m. within the exhibition galleries to spiritually purify the sacred objects. Happily, Pema lived in my apartment all summer as the exhibit remained in Zurich for three months. We had an uninterrupted 10 days together when I returned from a summer vacation in Indiana and a grand Family Reunion in Michigan. I was delighted to get to know Pema at last and show her around my adopted country. When the special Bhutan exhibit ended its run in Zurich, Pema returned to Bhutan to run the Textile Museum. Bhutan weaving is world renowned for its outstanding quality and many historic Bhutanese woven items are displayed in famous galleries. Last summer my brother and his wife were invited to be special guests and for my brother to photograph Pema’s wedding ceremony. It was a very joyous occasion. My bearded brother looked like an ancient Asian philosopher, except for his height and pink knees showing between his knee socks and his Gho, the traditional Bhutanese coat! My dear house guest, Pema, is now a mom. She delighted me this Spring with photos of her newborn son Dharma Benza born March 1, 2015!